Our resident “Code Guy”, Roger Papineau has been a long-standing, committed member of the Home Builders Association of the Grand Traverse Area, Inc. He served as President of the Association in 1996 and 2007 and has served as Chair of the Code and Bylaws Committees for many years. He is a respected and knowledgeable advocate for the Home Building Industry and affordable housing. 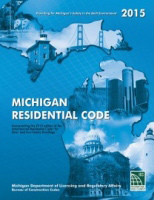 4/25/2016 The Michigan Bureau of Construction Codes has issued a list of corrections and interpretations to the 2015 Michigan Residential Code. The list can be found here. More corrections are expected to be identified in the near future. Watch for future announcements. The APA has recently announced the availability of a free design tool to aid in the identification and design of braced wall lines. The tool is available at http://www.apawood.org/calculator. Free registration is required to access the calculator. 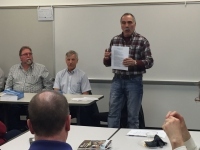 The 2015 Michigan Plumbing Code will become effective April 20th, 2016. Part 7 Administrative Rules apply. The 2015 Michigan Mechanical Code will take effect April 12th, 2017. Part 9A Administrative Rules apply. The 2015 Michigan Rehabilitation Code for Existing Buildings took effect December 13th, 2016. Administrative rules apply. The 2015 Michigan Residential Code went into effect February 8th, 2016. Part 5 Administrative Rules apply. All permit applications submitted by close of business 2/5/2016 will be permitted and inspected to the 2009 MRC. Code books may be purchased through the Bureau of Construction Codes. This is also available as a PDF download. Click on the link below. NOTE: The published version contains several errata. Go here for clarification/corrections. More corrections are expected to be announced. The 2015 Michigan Building Code will take effect April 20th, 2017. Part 4 Administrative Rules apply. The Bureau of Construction Codes has published an advisory regarding "qualified" blower-door testers here. A corrected Roof Loading Data Sheet, Figure R802.10.1, for use with the 2015 MRC can be found here.